Gorgeous berry toned wedding inspiration, perfect for any season. I was reminded of this styled wedding while on a client meeting today. The bride to be pulled out her cleverly designed mood board and lo and behold one of the images was the very cake I’m about to show you below. How did I know it was this cake? Because (cake maker) did a fabulous job with this one of a kind creation, which makes it super memorable. You guys I wasn’t even at this shoot and I still remember this cake just from the photos! Scroll below to see all the magical berry tones and how all my vendor friends pulled together to create a gorgeous experience to be sought after. Seriously, ya’ll how do I get so lucky to work with such amazing vendors? This shoot was coordinated by the extremely talented Taylor’d Southern Events. Every detail is always stunning and well thought out. This cake as mentioned above, was so super dreamy and memorable. I’m personally not a fan of frosting. I typically scrape all the frosting off my cakes and cupcakes. It’s just too sweet for me and over powers the flavor of the actual cake. If I’m being 100% honest, I’m actually not a cake person at all. I’d soooo much rather have ice cream or a nice cookie. This is probably due to my frosting issue. But this cake! This cake I would eat. That lake of frosting that so perfectly shows just the slightest of crumby delectably spongey goodness, and the perfect flecks of gold, make this cake so appealing. ANNDDDD now I’m hungry. This gorgeous cake was created by Beyond the Whisk If you’re local to California and get to try anything that comes out of this bakery, I seriously envy you! Oh you thought the cake was making you hungry? Well let’s talk more about the table setting that so perfectly accented the theme of this day. 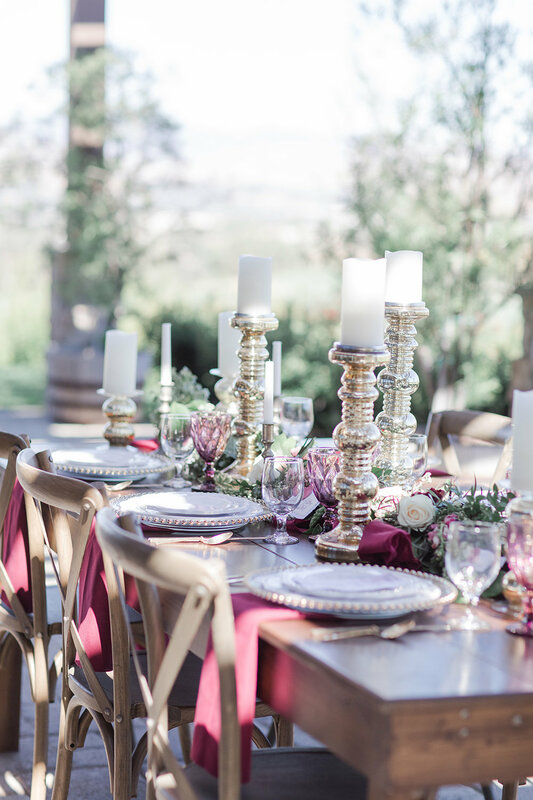 Jewel tones, golden candle pieces, a hint of rustic charm and the cutest gold rimmed chargers, complete with vintage pink glasses made this table scaping the perfect setting. Table settings and rentals provided by provenance rentals and avpartyrentals with gorgeous greenery and florals from sacred romance floral of course! Oh and what’s that I spy? A custom menu and place card from yours truly? For this setting I chose to go with a gorgeous hand made paper with the softest of deckled edge. OK let’s talk about the couple! How stink’n cute are these two and their entourage? Let’s talk about the stationery! I loved creating this suite. I decided on a mix of handmade paper and the smallest peek of vellum in the envelope liner. Everything was enclosed with a pink silk ribbon with an interested bow tie and a wax seal. I wanted to keep the overall design clean but have pops of the deep burgundy. I am so in love with the job that Sacred Romance did! All the bridesmaids bouquets are simply gorgeous. I have a soft spot for thistle. And heck yes to that bountiful bridal bouquet.